We thought this was a good example of unusual label design, and so did Mike Carter. Mike probably knows quite a bit more about art and design, compared to us, but then again we’ve looked at as many wine labels as anyone. Who is Mike Carter? For more than a decade Mike has been helping wine companies reduce their print & packaging costs and improve supply chain efficiency. Mike is also a published author with articles published on wine.co.za, Practical Winery & Vineyard and WineLand magazines. Mike earned his MBA at Bond University and lives in Somerset West, South Africa. His blog covers wine label design, very well. 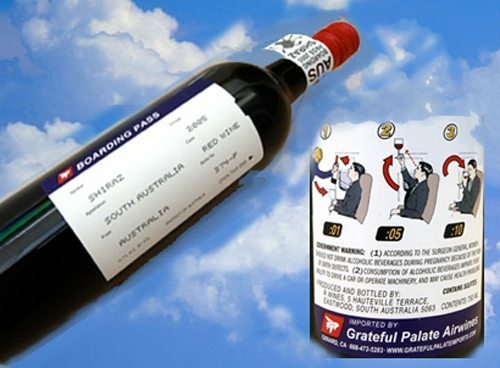 We also wanted to mention the above label because The Grateful Palate seems to have a propensity to find uncommon labels. We have showed their Punk and Evil wine labels in the past.